President Trump has repeatedly said it would better to "get along" with Russia. President Donald Trump may finally get his wish – a summit with Russian President Vladimir Putin – as his National Security Adviser John Bolton heads to Moscow to discuss a potential meeting between the two leaders, a National Security Council spokesperson confirmed Thursday. This would be the first formally-arranged meeting between Trump and Putin after they talked on the sidelines of two international summits in 2017, and it comes after the president's repeated calls for stronger ties with Russia and warm words for Putin. But those calls have unnerved U.S. allies abroad and angered critics at home, who point out Putin's abysmal human rights record; aggression in the U.K., Ukraine, Georgia, Syria, and other countries; and interference in U.S. politics, including Trump's own election in 2016. 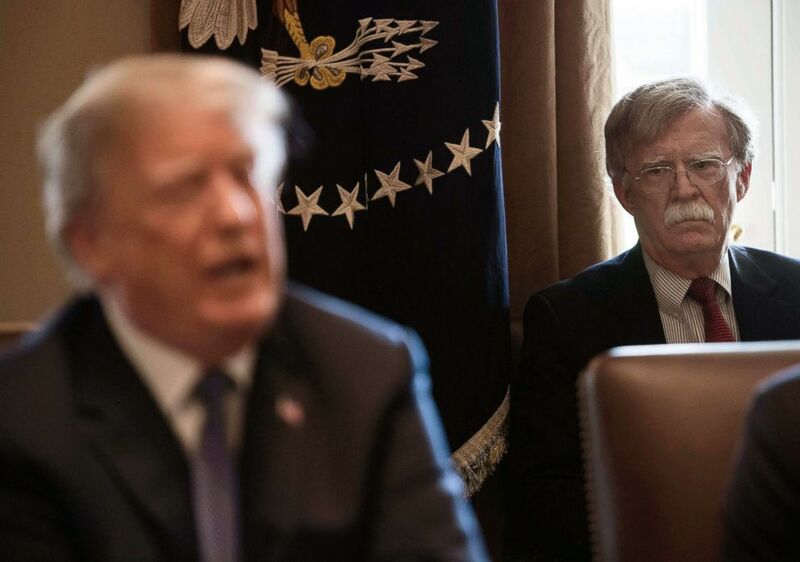 (Nicholas Kamm/AFP/Getty Images) New National Security Adviser John Bolton, right, listens to President Donald Trump speak during a cabinet meeting at the White House in Washington, D.C., on April 9, 2018. President Trump said that "major decisions" would be made on a Syria response in the next day or two, after warning that Damascus would have a "big price to pay" over an alleged chemical attack on a rebel-held town. Trump himself floated a possible meeting last Friday when speaking to reporters, saying that it "may" happen and that, "It's much better if we get along with them than if we don't." Now, with Bolton traveling to Moscow, there are reports that the two sides are looking at a July meeting, possibly in a third-party country like Austria, which has a right-leaning populist leader that both Trump and Putin support. The visit would come around Trump's attendance at an annual major NATO summit, after he attended last year's meeting and blasted the Western military alliance's European members for not spending enough on defense. While supporters say the tough words are needed to galvanize Europe to care about defense, critics see it as undermining trust in the alliance, essential to its success. It also comes as he continues to call for Russia to be readmitted to the G7 nations. Russia was expelled from the G8 in 2014 for its illegal seizure of Crimea and incursion into eastern Ukraine. But Trump blamed former President Barack Obama for the crisis in Crimea and said it was Obama's personal animus that led to Russia's suspension: "I think President Obama didn't like him," Trump told reporters last Friday. Now, key allies like Germany, France, and the U.K. – which suffered a Russian chemical weapons attack on its soil earlier in March – are growing alarmed that Trump is disrupting America's traditional alliances in favor of strongmen like Putin and Kim Jong Un, whom Trump has repeatedly praised as "very talented" and capable of "turn[ing] that country into a great, successful country." Even while Trump's rhetoric has caused concern, he and his supporters argue he is tougher on Russia, taking into account what his administration has done. That's mostly true, with a series of steps that have pushed back on Russia, including some the Obama administration wouldn't take. In December, Trump's administration decided to arm Ukraine with lethal weapons, and his State Department has consistently criticized Russia for leading, arming, and supporting separatist rebels in eastern Ukraine. While the Obama administration increased aid to Ukraine, and rallied European partners to slap Russia with international sanctions, it never crossed the line into providing lethal support. The Trump administration has kept those sanctions in place, and senior officials have said they will remain so until Russia withdraws from eastern Ukraine, abides by the peace deals it pledged to support – known as the Minsk agreements – and returns Crimea to Ukraine. 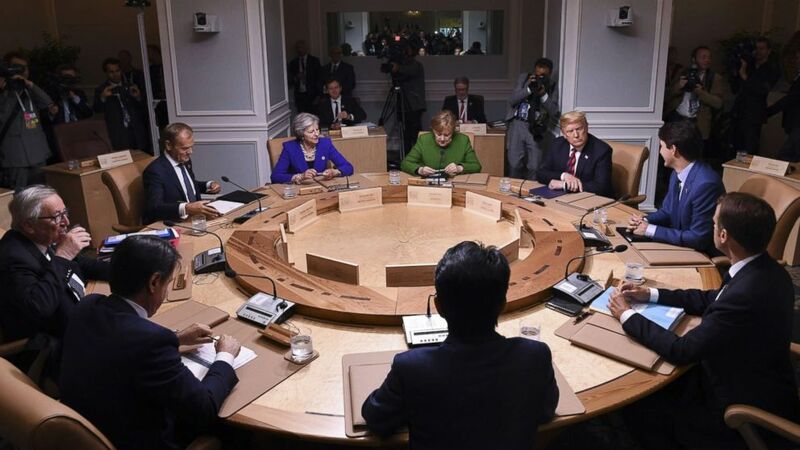 (Saul Loeb/AFP/Getty Images) Leaders of the G7 participate in a working session of the G7 Summit in La Malbaie, Quebec, Canada, June 8, 2018. After Russia retaliated for U.S. sanctions by forcing the U.S. to shrink its diplomatic missions in Russia, Trump responded by "thanking" Putin "because we're trying to cut down on payroll," again stoking outrage. But his administration then expelled a number of Russian diplomats and shut down two Russian facilities in New York and Washington and the Russian consulate in San Francisco – reportedly a major spy hub for the country. In March, a former Russian spy and his daughter were poisoned, allegedly by Russian agents, in Salisbury, U.K., and the administration again expelled Russian diplomats and closed the consulate in Seattle, as other U.S. allies in Europe and elsewhere took similar measures. 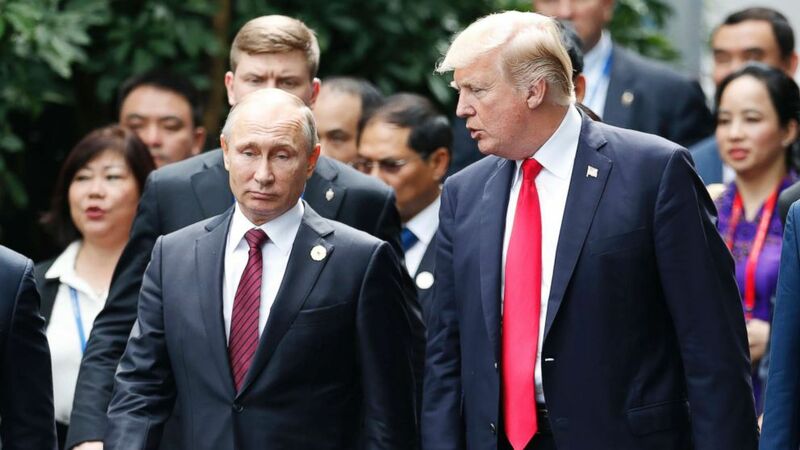 But Trump was reportedly upset that the U.S. did the heavy lifting and expelled the most diplomats, and days after the expulsions, Trump called Putin to "congratulate" him on his reelection, despite aides urging him not to do so and the elections being largely seen as fraudulent. On the world stage, Trump's record is also a mixed bag. He has ordered airstrikes against Russian ally Syrian President Bashar al Assad for chemical weapons use and expanded domestic energy production and the sale of U.S. liquefied natural gas to counter Russia's energy strong-arming of European neighbors. But he's also slapped tariffs on U.S. allies in Europe and Canada and accused them of cheating America, driving the kind of wedge that Russia has long been seeking. What's at stake in a summit? Putin and Trump's critics expect the same outcome of a Trump-Putin summit then – that Trump would reverse some of the tougher actions his administration has taken and further damage America's western alliances. In particular, given Trump's effusive praise of Kim Jong Un after their summit, there's concern that Trump will seek a good personal relationship with Putin, at a price to U.S. national security. "What I worry about in this particular meeting is the peculiar style of President Trump in meeting with autocratic leaders around the world... [that] he'll seek a good relationship, a friendly relationship and we'll see all kinds of praise for President Putin, like he did with the North Korean leader, without any results, and that to me does not serve American national interests," former U.S. ambassador to Russia Michael McFaul told France 24 television. On Russian state television, there was speculation that he could recognize Crimea as part of Russia, something U.S. officials have vociferously denied. (Jorge Silva/AP) President Donald Trump, right, and Russia's President Vladimir Putin talk during the family photo session at the APEC Summit in Danang, Vietnam, Nov. 11, 2017. But there are real issues in the U.S.-Russian relationship that need to be resolved, and some foreign policy hands favor meetings over continued confrontation, including McFaul. When Trump and Putin met in November in Vietnam on the sidelines of the ASEAN conference, they signed an agreement on a ceasefire zone created in southwest Syria, where U.S. and Russia continue to have tensions over the future of the country. The U.S. is also seeking Russian cooperation on continued sanctions implementation against North Korea and steps toward the country dismantling its nuclear weapons program. Regardless of the meeting's outcome, the president's fiercest critics say that even by meeting with Putin at all, he's undermining the NATO alliance. "Trump's plan to meet Putin immediately before or after the NATO summit is a slap in the face to the alliance, whose mission centers largely around deterring Russian aggression. And that's probably just as Trump intended," tweeted former National Security Council spokesperson Ned Price. ABC News's Jordyn Phelps contributed to this report.